MagLite® Solitaire and Leatherman Micra Gift Set with your Corporate Logo! A perfect corporate gift combination. 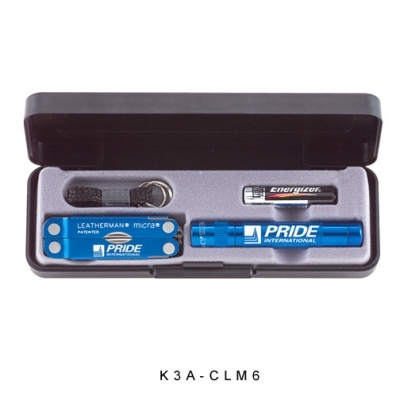 Your logo on a Mag-Lite and a Leatherman tool. Together in a durable presentation gift box. Includes 1 “AAA” battery and key ring/lanyard attachment. The Mag-Lite® Solitaire is paired with the Leatherman® Micra® Tool which features spring action scissors, knife blade, nail file and much more. All sets come beautifully packaged in a sleek presentation box. A terrific upgrade when your clients are looking for the ultimate personal accessory set. • Mag-Lites® available in Black, Royal Blue, Red, Dark Green, Gray, Pink, Navy and Orange. • Standard LM6 is stainless steel. • Colored Leatherman® available in Black, Blue, Red, Green and Gray. Color: Sets Available In Red, Black, Blue, Gray Or Green. 1/4"H x 5/8"L on Either Side of Dip.